The Volkswagen Golf Mk7 (also known as the Golf VII) is a compact car, the seventh generation of the Volkswagen Golf and the successor to the Volkswagen Golf Mk6. It was announced in Berlin on 4 September 2012, before a public launch at the 2012 Paris Auto Show. Cars reached Volkswagen dealers in the Golf's European domestic market on 10 November 2012. The Golf Mk7 uses the same MQB platform as the third-generation Audi A3, SEAT León and Škoda Octavia. At its introduction in 2013, it won the Car of the Year Japan Award, the first time it was awarded to a European product. On 10 November 2016, VW presented a facelift of the Golf Mk7. Compared with the previous generation, the Golf Mk7 has a roomier cabin, with greater shoulder room for the front and rear passengers, rear legroom and boot space. It is 20 mm broader than the Mk6 and the wheelbase is 59 mm longer. First series production Volkswagen with Proactive Occupant Protection (similar to Mercedes-Benz Pre-Safe), which will close the windows and retract the safety belts to remove excess slack if the potential for a forward crash is detected. Seat belt retraction in a crash situation was also a feature on the mk6 for the front two seat belts. The front two belts retract if it was buckled in, however if the occupant is relatively light, the seat belt gradually extendeds in a forward crash situation. First series production Volkswagen with multi-collision brake system to automatically brake the car after an accident in order to avoid a second collision. Available body styles are three and five door hatchbacks (including high-performance Golf GTI and Golf R models), a five-door estate (known as the Sportwagen in the United States, first advertised in May 2015), and a five-door Golf SV (which replaces the Golf Plus) Sales of the 3-door hatchback haven't been as strong as previous generations and is likely to be dropped when it enters its 8th generation later in 2019. Variants to be introduced later include a five-door Golf CC liftback, and two-door cabriolet. The Golf went on sale in the UK in early January and was released in Australia in April 2013. In Brazil, the Golf Mk7 went on sale in September 2013, only in the Highline and GTI trims, along with the Comfortline trim, which was made available from March 2014. All models were imported from Germany. VW confirmed that models from August 2014 on will be imported from Mexico, from the VW Puebla factory. As of 2015, the VW Golf MK7 and Estate MK7 is made in Puebla, Mexico. However, starting in 2019, all new Golfs will be made in the Wolfsburg plant. The Golf line is available in all the relevant drive systems: the Golf TSI, including GTI, is petrol-powered; Golf TDI, including GTD, is diesel-powered; the Golf TGI is powered by compressed natural gas (CNG); the e-Golf is powered by electricity; and Golf GTE is a plug-in hybrid. The use of a modular transverse matrix assembly kit enables the manufacturing of Golf models with gasoline, diesel, natural gas, electric and hybrid drives from bumper to bumper at Volkswagen factories. Retail deliveries of the e-Golf in Germany are scheduled to begin in the second quarter of 2014. U.S. sales are slated to start on selected markets during the fourth quarter of 2014. The Golf GTE will be launched also in the fourth quarter of 2014. Car and Driver's 10Best list in 2019. Based on the VW Sportvan concept shown at the 2013 Frankfurt Motor Show and sold as the Sportsvan in many markets, it uses the VW Group MQB platform shared by many of Volkswagen's range and is assembled at the manufacturer's Wolfsburg plant alongside the standard Golf sedan/saloon (but not with the "Variant" estate version of the Golf, which is produced in a separate plant). The Golf SV is the third variant of the seventh-generation Golf, alongside the hatchback and the Estate, and has a look that clearly follows the design of its siblings, with strong elements of Volkswagen’s design ‘DNA’. At 4,338 mm long, the new SV is 134 mm longer than the Golf Plus that it replaces, 83 mm longer than the Golf hatchback, and 224 mm shorter than the Golf Estate. Compared with the boot of its predecessor, capacity is increased by 76 litres to 500 litres with the back seats at their rear-most position (versus the Golf’s 380 litres and the Estate’s 605 litres). Moving the rear seats forwards increases the luggage capacity to 590 litres, while folding the rear seats liberates up to 1,520 litres of room. The front passenger seat can also optionally fold fully forward, creating a load space which is up to 2,484 mm long. Like the Golf, the Golf SV comes with many standard and optional safety systems. These include a standard automatic post-collision braking system, which automatically brakes the vehicle after a collision to reduce kinetic energy significantly and thus minimise the chance of a second impact, and a PreCrash system (Proactive Occupant Protection) which, on detecting the possibility of an accident, pre-tensions seatbelts and closes the windows and sunroof, leaving just a small gap, to ensure the best possible protection from the airbags. A first for the Golf SV is a blind spot monitor, dubbed Side Scan, with an assistant for exiting parking spaces. This monitors the area behind and to the sides of the vehicle, ensuring easier and safer egress when reversing from a parking bay. It will be packaged as an option together with Lane Assist. Powering the SV is a range of petrol and diesel engines, all of which incorporate Stop/Start and battery regeneration systems. There are two turbocharged 1.2-litre petrol engines with 85 and 110 PS; two 1.4-litre turbocharged petrol engines with 125 and 150 PS; and three turbodiesels: a 2.0-litre 150 PS, a 1.6-litre 90 PS and a 1.6-litre 110 PS. When fitted in the Golf SV BlueMotion, this last engine is expected to return fuel economy of 76.3 mpg and emit 95 g/km of CO2. All engines apart from the 1.2-litre TSI 85 PS can be ordered with a DSG gearbox. Like the Golf hatchback, the Golf Estate – marketed as the SportWagen in the United States and Canada – is available in S, SE and GT (Trendline, Comfortline and Highline in Canada) (GT is SEL in the USA) trim levels. The Golf Estate’s loadspace volume has been expanded from the 505 litres of its predecessor to 605 litres (loaded up to the back seat backrest), versus the 380 litres of the Golf hatchback. Loaded up to the front seat backrests and under the roof, the new Golf Estate offers a cargo volume of 1,620 litres (versus the 1,495 litres of the Golf Estate Mk VI). The rear seat backrests can be folded remotely via a release in the boot. Four petrol engines and three diesel engines are available, ranging from 85-140 PS in the petrol and 90-150 PS for the diesel engines. For the first time, the Golf Estate will also be available as a ‘full’ BlueMotion model (with other modifications including revised aerodynamics). This model uses a 1.6-litre diesel engine producing 110 PS, has a six-speed manual gearbox, and is expected to achieve a combined fuel consumption of just 85.6 mpg (equivalent to 87 g/km of CO2). Like the Golf hatchback, the new Golf Estate is based on the MQB platform (both have the same wheelbase). Volkswagen have announced the upcoming launch of a Golf Estate R, using the same EA888 2.0 engine found in the MkVII Golf R hatchback. The Golf Variant is also built as a rugged version called 'Alltrack' with slightly-raised suspension, body cladding, and all-wheel drive. The production version of the 2015 Volkswagen e-Golf was unveiled at the 2013 Frankfurt Motor Show. According to VW the e-Golf has a practical all-electric range of 130 to 190 km (81 to 118 mi), with an official NEDC cycle of 190 km (118 mi), and the winter range is expected to be 80 to 120 km (50 to 75 mi). In October 2014, the EPA announced the 2015 e-Golf has a range of 83 mi (134 km), and combined city/highway efficiency of 116 miles per gallon gasoline equivalent (MPGe). Production of vehicles destined for retail customers began in March 2014. On 14 February 2014, Volkswagen launched sales of the e-Golf in Germany, with pricing starting at €34,900 (~US$47,800). On 11 March 2014, Volkswagen opened ordering for the e-Golf in the UK, and announced pricing of GB£30,845. UK deliveries began at the end of June. In April 2014, Volkswagen announced that the U.S. version of the 2015 e-Golf would not have a liquid-cooled battery pack because strict testing showed high ambient temperatures did not affect battery performance. In Norway, the e-Golf became available for pre-order on 25 February 2014 for delivery in June 2014. Over 1,300 cars were ordered that same day. By 3 March 2014, nearly 2,000 cars had been pre-ordered. Prices range from 251,800 kr (~US$42,000) for the basic model to 302,000 kr (~US$50,000) with all available options, comparable to the cheapest petrol and diesel models. The VW e-Golf was the top selling plug-in electric car in July 2014 with 391 units sold and representing 34.4% of the Golf nameplate sales (1,136), which was Norway's top selling new car that month. The e-Golf was again the top selling electric car in August 2014 with 467 units sold, representing 43.4% of the Golf nameplate sales that month (1,075). In two months and a half a total of 925 Volkswagen e-Golf cars have been sold in Norway, surpassing initial Model S sales which delivered 805 units during its first two months in the Norwegian market. A total of 1,358 units have been sold in Europe through August 2014. U.S sales are slated to start in selected markets in November 2014 at a price for the SEL Premium model starting at US$35,445 before any applicable government incentives, plus US$820 destination and delivery. Volkswagen of America sold 119 units of the e-Golf during November 2014, the first full month of sales for the vehicle. In Spain, 2015, the price of a brand-new e-Golf was at 35,500 euro. The Golf GTE plug-in hybrid is driven by two power sources: a 1.4-litre 110 kW (150 PS; 148 hp) TSI direct-injection petrol engine and a 75 kW electric motor. Together, they combine to produce power of 150 kW (204 PS; 201 hp) and 350 N⋅m (258 lb⋅ft) of torque, with a theoretical range of 933 km (580 mi). Using the electric motor alone, the GTE is capable of speeds of 130 km/h (81 mph). With the TSI engine as well, the Golf GTE can accelerate from 0-100 km/h (62 mph) in 7.6 seconds and on to a top speed of 215 km/h (134 mph). The Golf GTE shares the basic powertrain hardware with the Audi A3 Sportback e-tron but the software controls are different. The Golf GTE also shares the same plug-in hybrid powertrain with the Volkswagen Passat GTE, but the Passat has a larger 9.9 kWh Li-ion battery pack. In EV mode, the Golf GTE has an all-electric range of 50 km (31 mi). The all-electric mode can be activated at the push of a button. Under the New European Driving Cycle, combined fuel economy is 1.50 L/100 km (157 mpg‑US) equivalent. The electric power can also be saved – for example when driving to a zero-emissions zone. The 8.8 kWh lithium-ion battery can be charged in around three and a half hours from a domestic mains outlet, or two and a half hours from a domestic wallbox. The battery weighs 120 kg (265 lb), giving the GTE a total kerb weight of 1,520 kg (3,351 lb). The Golf GTE uses a six-speed DSG gearbox with a triple-clutch system specially developed for hybrid vehicles. The electric motor is integrated into the gearbox housing, while further hybrid components include power electronics and a charger. An electro-mechanical brake servo and an electric air conditioning compressor make for energy-efficient braking and air conditioning. Inside as on the outside, the Golf GTE features blue highlights where the GTI has red. This includes stitching on the steering wheel, gear lever gaiter and seats, and a blue stripe in the tartan pattern on the sports seats. A 5.8-inch touchscreen display is standard, the 8-inch Discover Pro satellite navigation system with DAB radio and Bluetooth is a £1765 option, and includes bespoke functions for electric vehicles, including the ability to identify potential destinations on electric range, and electric charging points.The GTE will also feature an e-manager which allows the driver to preset vehicle charging, as well as interior cooling or heating. These functions can also be operated remotely using the Volkswagen Car-Net app on a smartphone: a three-year subscription will be included in the UK. The first GTE units were registered in Germany in August 2014, and it was the second-best selling plug-in hybrid in Europe in 2015 with 17,282 sales. The new GTD is powered by a 2.0-litre turbocharged common rail diesel engine with 184 PS (135 kW; 181 hp). Maximum torque – the characteristic that arguably best defines the easily accessible performance of the GTD – has risen from 350 N⋅m (258 lb⋅ft) to 380 N⋅m (280 lb⋅ft) from 1,750 rpm. The Golf R, in comparison, has 380 N⋅m (280 lb⋅ft) from 1,800 rpm. Acceleration from 0-100 km/h (62 mph) takes 7.5 seconds, while the top speed is 227 km/h (141 mph). The GTD has a combined fuel consumption of 4.18 L/100 km; 56.2 mpg‑US (67.5 mpg‑imp), making for CO2 emissions of only 109 g/km. With the optional six-speed DSG, fuel consumption is 4.50 L/100 km; 52.3 mpg‑US (62.8 mpg‑imp) and CO2 emissions of 119 g/km. For comparison, when the first generation Golf BlueMotion went on sale at the end of 2007, it had the same fuel economy and CO2 emissions. As with the GTI, a very high level of safety equipment is found as standard on the MkVII GTD. The new GTI is powered by a 2.0-litre turbocharged direct-injection petrol engine (TSI) with 220 PS (162 kW; 217 hp). In the GTI Performance version, the engine’s maximum power is boosted to 230 PS (169 kW; 227 hp). Both GTI models develop a maximum torque of 350 N⋅m (258 lbf⋅ft). The standard GTI accelerates to 62 mph (100 km/h) in 6.5 seconds and reaches a top speed of 152 mph (245 km/h). The GTI Performance has a top speed of 155 mph (249 km/h) and takes 6.4 seconds for the sprint to 62 mph (100 km/h). Despite its performance, it is in insurance group 29E – five groups lower than its predecessor. Both versions of the GTI are equipped with a Stop/Start system and fulfill the EU-6 emissions standard that takes effect in 2014. With a six-speed manual gearbox, they attain the same low fuel consumption value of 47.1 mpg‑imp (6.00 L/100 km; 39.2 mpg‑US) (CO2 emissions of 139 g/km). This means that the latest Golf GTI offers an 18 per cent improvement in fuel economy compared to the previous model. With the optional six-speed DSG gearbox, the two GTI models achieve fuel consumption figures of 44.1 mpg‑imp (6.41 L/100 km; 36.7 mpg‑US) (equivalent to 148 g/km CO2 for the standard GTI and 149 g/km CO2 for the GTI Performance). Buyers who opt for the £980 Performance pack gain not just an extra 10 PS of power, but also upgraded brakes and a limited-slip differential. The front differential is a new development, dubbed VAQ. This provides more neutral and agile driving behaviour and allows higher speeds to be carried through curves. The system consists of a multi-plate coupler between the differential cage and right driveshaft, which controls locking torque electro-hydraulically. Visually, vehicles with the Performance pack are distinguished by ‘GTI’ lettering on the front brake calipers, black mirror caps, and red GTI badges on the front and rear. As well as high performance, a high level of safety equipment comes as standard in the Golf GTI. On top of high passive safety levels – thanks in part to a passenger cell made from high- and ultra-high strength steels – active safety features include the Automatic Post-Collision Braking system, which automatically applies the vehicle brakes after an accident to reduce the chances of a second impact; the pre-crash system, which tensions seatbelts and closes windows and the sunroof if an accident is likely to improve the effectiveness of the airbags; Front Assist, which warns the driver in the event of coming too close to the vehicle in front, can prime the brakes, and operates at speeds of up to 99 mph; City Emergency Braking, which can automatically brake the vehicle at speeds below 18 mph; Automatic Distance Control, a radar-operated cruise control that maintains a set distance from the vehicle in front; and seven airbags as standard, including one for the driver’s knees. In countries like Mexico, the GTI version is only available with the 5-door body style, with no plans to introduce the 3-door body. On September 21, 2018, Volkswagen announced it will make "Rabbit Edition" GTI's for the 2019 model year. The Rabbit Edition will feature a LED lighting package, "Vmax" spoiler, 18-inch "Pretoria" alloy wheels painted in gloss black, and red tags embroidered with the VW Rabbit logo on the seat. Like the GTI, the Golf R is also built as a 3 or 5 door hatchback. It is powered by a newly developed version of the 1,984 cc (2.0 L; 121.1 cu in) turbocharged EA888 petrol FSI Inline-four engine used in the latest Golf GTI (and Audi S3), but in this application producing 300 PS (296 bhp; 221 kW) (206 kW (280 PS; 276 bhp) for "hot climate" markets such as Australia, South Africa, Japan, USA) from 5,500 to 6,200 rpm and 380 N⋅m (280 lb⋅ft) from 1,800 to 5,500 rpm of torque. Compared to the GTI's powerplant, the Golf R's engine has a modified cylinder head, exhaust valves, valve seats and springs, pistons, injection valves and larger intercooler and turbocharger. DSG equipped models also come with an auxiliary oil cooler on the passenger side. 0-62 mph (100 km/h) takes 5.1 seconds (versus 5.7 seconds for previous Golf R), or 4.9 seconds with optional DSG gearbox. In 3rd-party testing, it has been recorded at 4.5 seconds using Launch Control. The top speed is electronically limited to 155 mph (249 km/h). Despite this increased performance, a combined fuel consumption of 39.8 miles per imperial gallon (7.10 L/100 km; 33.1 mpg‑US), and CO2 emissions of 165 g/km (159 g/km DSG) make the Golf R up to 18 percent more efficient than its predecessor. The R uses an updated, fifth-generation Haldex 4MOTION four-wheel drive system. Under low loads or when coasting, the rear axle is decoupled, helping to reduce fuel consumption. Drive to the rear axle can be engaged in fractions of a second via the Haldex coupling, which is actuated by an electro-hydraulic pump. Up to 50 percent of power can be transferred to the rear axle. A brake actuated, XDS+ system mimics a limited-slip differential by applying the brakes to the wheel with the least traction, this is on both the front and rear axles. The ride height is 20 mm lower than the standard Golf. Golf R models equipped with the optional 'DCC' (Dynamic Chassis Control), offer 3 suspension modes: 'Comfort', 'Normal', and 'Race'. Each mode adjusts the stiffness of the suspension damping, thereby offering drivers a way to change the way the vehicle responds by the push of a button. Comfort mode places the dampers in the softest setting, increasing the absorption of road imperfections allowing for a smoother and more comfortable ride. Race mode stiffens the dampers to their most aggressive setting, reducing body movements and increasing adhesion to the road for more precise high speed driving. Race mode also increases throttle response, firms up the steering for a heftier feel, and alters the shift pattern of the DSG gearbox (where fitted) as well as increases the speed of the Adaptive headlamps (AFS) response time. On top of ESC Sport mode, as found on the GTI and GTD, which delays intervention of the electronic stability control system, the R offers the option fully to disengage the ESC, for track driving. For the Canadian market, the optional Discovery Pro 8" infotainment system is available as part of the single option "Technology Package", while only the 6.5" Discover is available to US consumers. The Golf R comes (either standard or optional) LED tail lamps and front turn signals, 3-door version, electrically folding mirrors, spare tire and sunroof. All these features are not available to the North American version. The Golf R and e-Golf are the only Golf models available in North America still produced in Germany. Other Golf models for the North American market are now produced by Volkswagen de México in Puebla, Mexico. A limited edition Golf R400 was rumored in August 2015 by Heinz-Jakob Neusser, then-head of brand development, but in the wake of the Volkswagen emissions scandal (and Neusser's suspension) it was cancelled in favor of focusing on the Golf R.
In November 2016, Volkswagen revealed a facelifted version of the Golf MK7. This model is referred to as the "New Golf" by Volkswagen while it is often informally referred to as the Golf 7.5. A new engine was introduced along with the facelift; a 1.5 litre TSI which produces 95.6 kW (128.2 hp; 130.0 PS) or 110 kW (148 hp; 150 PS). Initially, the existing 1.4 litre TSI was available alongside this new 1.5 litre engine. The updated Golf GTI was increased from 162 kW (217 hp; 220 PS) to 169 kW (227 hp; 230 PS) in the standard car and from 169 kW (227 hp; 230 PS) to 180.2 kW (241.7 hp; 245.0 PS) with the performance pack. The Golf R similarly had its output increased from 221 kW (296 hp; 300 PS) to 228 kW (306 hp; 310 PS). In addition, the facelift increased infotainment screen size across the range as well as adding the option for a fully digital dashboard. The rear lights now utilise LED technology as standard (including a "sweeping" indicator effect on performance models) while this technology is optional on most models for the headlights. ^ "Golf-vii engines & performance". Volkswagen UK. Retrieved 14 July 2015. ^ "Golf-gti-vii engines & performance". Volkswagen UK. Retrieved 14 July 2015. ^ a b "Car of the Year 2013: VW Golf does it again". caroftheyear.org. 4 March 2013. Archived from the original on 7 March 2013. Retrieved 4 March 2013. ^ Kable, Greg (4 September 2012). "2013 Volkswagen Golf revealed". Autocar. Retrieved 4 September 2012. ^ Auto, Motor und Sport (7 November 2012). "VW Golf VII: Markteinführung am Samstag" [VW Golf VII: Market introduction during saturday]. auto motor und sport (in German). Archived from the original on 15 July 2015. Retrieved 14 July 2015. ^ GmbH, Frankfurter Allgemeine Zeitung (10 November 2016). "Weltpremiere in Wolfsburg: VW hat den Golf renoviert". FAZ.NET. ^ Kable, Greg (4 September 2012). "Volkswagen Golf Mk7 engine line-up announced". Autocar. Retrieved 4 September 2012. ^ "World premiere of the new Golf in Berlin". Volkswagen AG. 4 September 2012. Retrieved 16 September 2012. ^ "Modelle < Volkswagen Deutschland". Retrieved 14 July 2015. ^ "2015 Volkswagen Golf: The best hatchback just got even better". Volkswagen US Media Newsroom. Volkswagen. Retrieved 5 December 2014. ^ "Volkswagen Golf 1.4 TSI (2013) CAR review | Road Testing Reviews | Car Magazine Online". Carmagazine.co.uk. 16 January 2013. Retrieved 21 February 2013. ^ TMR Team (18 April 2013). "New 2013 Volkswagen Golf 7 On Sale In Australia". themotorreport.com.au. Retrieved 24 January 2014. ^ "Auto Esporte – Novo Golf custará a partir de R$ 67.990; veja todos os preços". Auto Esporte. Retrieved 14 July 2015. ^ "Volkswagen Golf passará a ser importado do México". Retrieved 14 July 2015. ^ Constantine, Chris. "Volkswagen Golf Production Moves Back to Europe". ^ a b VW Media (21 February 2014). "Volkswagen to introduce Golf plug-in hybrid at Geneva; first deliveries in autumn". Green Car Congress. Retrieved 21 February 2014. ^ Damon Lowney (10 September 2013). "2015 Volkswagen e-Up! shows EV commitment at Frankfurt this season". Autoblog.com. Retrieved 10 September 2013. ^ a b VW Press Release (14 November 2013). "VW provides details on e-Golf prior to launch at LA Auto Show". Green Car Congress. Retrieved 16 February 2014. ^ "2013 Volkswagen Golf - "Technik und Preise"" (PDF). Volkswagen AG. 5 September 2012. Retrieved 6 September 2012. ^ "New Golf 2.0 TDI Comfortline". Volkswagen Group South Africa. Archived from the original on 22 February 2014. Retrieved 17 November 2013. ^ "2019 10Best Cars". Car and Driver. 29 November 2018. Retrieved 30 November 2018. ^ "North American Car & Truck of the Year". Retrieved 14 July 2015. ^ Mike Millikin (13 November 2014). "Volkswagen Golf family named "2015 Motor Trend Car of the Year"". Green Car Congress. Retrieved 15 November 2014. ^ Steven J. Ewing (28 March 2013). "Volkswagen Golf named 2013 World Car of the Year". Autoblog.com. Retrieved 29 March 2013. ^ "Volkswagen Golf Won the 2013-2014 Car of the Year Japan Award". Japan Automobile Importers Association. 23 November 2013. Retrieved 2 December 2013. ^ "Wheels COTY: How the Golf won". Wheels. 15 January 2014. Retrieved 16 January 2014. ^ "VW Golf Mark VII is 2013 Car of the Year". 5 December 2013. Retrieved 16 January 2014. ^ Chris Paukert (10 September 2013). "2015 Volkswagen e-Golf is ready to battle the Nissan Leaf". Autoblog.com. Retrieved 10 September 2013. ^ a b VW Media Services (15 February 2014). "Volkswagen launches the battery-electric e-Golf in Germany; "Das e-Auto"". Green Car Congress. Retrieved 16 February 2014. ^ Mike Szostech. "Volkswagen e-Golf gets EPA rated 83 mile range". My Electric Car News. Retrieved 21 October 2014. ^ Michaël Torregrossa (10 March 2014). "Volkswagen débute la production de la Golf électrique à Wolfsburg" [Volkswagen starts production of electric Golf in Wolfsburg] (in French). Association pour l'Avenir du Véhicule Electrique Méditerranéen (AVEM). Retrieved 11 March 2014. ^ Mike Szostech. "UK e-Golf – orders open, priced at £25,845". Retrieved 19 March 2014. ^ Mike Szostech. "Volkswagen chooses to drop the liquid cooling on the e-Golf". My Electric Car News. Retrieved 17 April 2014. ^ Skogstad, Knut (25 February 2014). "VW e-Golf: Solgte over 1.300 biler – på ni timer" [VW e-Golf: Over 1,300 cars sold—in nine hours]. TV2 / Broom (in Norwegian). Retrieved 25 March 2014. ^ Brorstad, Harald (3 March 2014). "Supre salgstall for e-Golf og e-UP!" [Great sales figures for e-Golf and e-UP!]. Motormagazinet (in Norwegian). ^ "Volkswagen e-Golf kundepriser per 24.02.2014" [Volkswagen e-Golf retail prices as of 15 February 2014] (PDF) (in Norwegian). Volkswagen. Archived from the original (PDF) on 26 March 2014. Retrieved 25 March 2014. ^ "Ny Volkswagen Golf kundepriser per 01.01.2014" [New Golf retail prices as of 1 January 2014] (PDF) (in Norwegian). Volkswagen. Archived from the original (PDF) on 26 March 2014. Retrieved 25 March 2014. ^ Norwegian Road Federation (OFV) (August 2014). "Bilsalget i juli" [Car sales in July] (in Norwegian). OFV. Archived from the original on 10 August 2014. Retrieved 23 August 2014. Click on "Modellfordelt" to display the top 20 selling new cars in Norway. ^ Automotive Industry Data (AID) (6 August 2014). "Every second electric car sold in Norway this July came from Volkswagen". AID. Retrieved 23 August 2014. In July 2014 the top selling electric cars in Norway were the Volkswagen e-Golf with 391 units, the Nissan Leaf with 313 and the Volkswagen e-Up! with 282. ^ Ståle Frydenlund (2 September 2014). "VW e-Golf slår Teslas superstart" [VW e-Golf beats Tesla's super start] (in Norwegian). Norsk Elbilforening (Norwegian Electric Vehicle Association). Archived from the original on 8 September 2014. Retrieved 13 September 2014. ^ Norwegian Road Federation (OFV) (September 2014). "Bilsalget i august" [Car sales in August] (in Norwegian). OFV. Archived from the original on 6 September 2014. Retrieved 13 September 2014. Click on "Modellfordelt" to display the top 20 selling new cars in Norway. ^ Jose Pontes (29 September 2014). "Europe August 2014". EVSales.com. Retrieved 21 October 2014. ^ VW Press Release (25 August 2014). "Volkswagen prices e-Golf in US at $35,445". Green Car Congress. Retrieved 26 August 2014. ^ VW Press Release (2 December 2014). "VOLKSWAGEN OF AMERICA REPORTS NOVEMBER 2014 SALES". Volkswagen of America. Archived from the original on 10 December 2014. Retrieved 5 December 2014. ^ "Configurador < Volkswagen España". Retrieved 14 July 2015. ^ "Longer Range Volkswagen e-Golf goes on sale in Germany". My Electric Car Forums. Retrieved 26 June 2018. ^ Mike Millikin (13 March 2014). "Volkswagen: e-mobility and sustainability; Part 1, the e-Golf and Golf GTE". Green Car Congress. Retrieved 13 March 2014. ^ Mike Millikin (29 September 2014). "Promised VW Passat plug-in hybrid to debut at Paris show; both sedan and wagon". Green Car Congress. Retrieved 29 September 2014. ^ Noah Joseph (20 February 2014). "VW Golf GTE plugs in the GTI for guilt-free fun". Autoblog.com. Retrieved 29 September 2014. ^ Jose Pontes (13 September 2014). "Germany August 2014". EVSales.com. Retrieved 29 September 2014. ^ Georg Kacher, ed. (4 February 2014). "VW Golf R 2014 review". carmagazine.co.uk. Retrieved 29 June 2018. ^ Jens Meiners (25 April 2016). "With Golf R400 canceled, VW shifts to Golf R". AUTOMOTIVE NEWS. Retrieved 25 April 2016. ^ Lette van Oostvoorne, Nick (10 November 2016). "2017 VW Golf Mk7 facelift old vs new compared". Retrieved 5 January 2019. 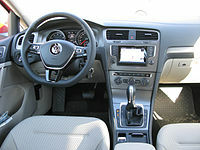 Wikimedia Commons has media related to Volkswagen Golf VII. Wikimedia Commons has media related to VW e-Golf.